The Captur’s crossover design may not appeal to all at first glance. But, spend some time with it and the edgy design grows on you. We once parked it next to a Duster at a restaurant and were pleasantly surprised at how mature the Captur looked. Yes, it isn’t as tall as a conventional boxy SUV, but there’s no doubt that it looks like a premium offering. Will you give it a second glance? Oh yes. It’s got a bit of novelty on its side for now, and the bright orange colour our test car wore only aided the eye-ball grabbing. There are some premium car elements here too. That includes the full-LED headlamps and the Audi-like ‘dynamic’ turn indicators. Low beam has a wide spread and a long throw too. But, in terms of illumination – it felt just a bit brighter than the LED projectors we’ve used in the Ignis or the Dzire. The profile and the rear are a notch understated compared to the face. The design here has some understated French flair, which is going to be an acquired taste for most. That said, the 17-inch wheels look classy, and the 215/60R17 tyres look just right sitting under the flared wheel arches.The two-tone is well-executed, and it’s easy to see why Renault say the Captur was designed to sport a dual-tone paint scheme even since it was conceptualised. Keep in mind that the dual-tone combination will be an option. There’s quite a lot of customisation options on offer as well, which should give you the liberty to deck the Captur up the way you want to. 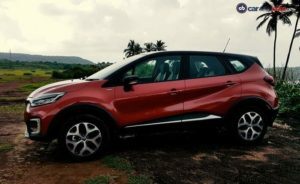 From the rear, the Captur tries hard to shrug off the resemblance to the little Kwid. The tail lamps, the bumper and the windscreen all look like polished, grown-up version of the hatchback. That’s not necessarily a bad thing in our books, though. While there’s nothing to complain about the chic exteriors, the interiors are a bit of a hit-and-miss. The wrap-around dashboard is a fresh design and certainly feels like a step up from the Duster’s. There are also some great design touches such as the butterfly-shaped instrument cluster that gets a large digital speedometer in the centre, flanked by a tachometer and a fuel gauge. And I really like the ambient LED lighting and design of the air conditioner controls. However, our biggest gripe is the type of materials that have been used for the dashboard and the overall use of hard plastics for the interiors. They don’t feel as upmarket as they should for a car in this category, especially the roof liner which feels like it’s from one full segment below.Then there are some slightly wonky design elements, like the centre armrest – it doesn’t fold away and interferes with the operation of the handbrake lever. We really hope that all variants of the Captur offer hill- hold assist; trying to start moving from a standstill on an incline will be quite tricky otherwise. Then there are the front seats. Only the driver’s seat gets height-adjust, which is fine. What isn’t fine, however, is the fact that even the lowest setting on the seat is so high that it not only gives you a commanding view of the road but also of the entire top of the very large dashboard; this serves as a visual reminder of the basic quality of plastics that populate much of the cabin. And, if you’re on the taller side, say over 6ft, you are going to be uncomfortably close to the roof. The other ‘fit’ issue with the Captur can be found in driver’s footwell. The pedals are well proportioned and placed, but forget a dead pedal, there’s almost no space to the left of the clutch. This means the driver needs to keep his left foot under the clutch pedal when cruising; not an easy transition to make if you have large feet. Renault made a big deal about its ‘panoramic’ windscreen and minimal A-pillars, along with the quarter windows designed to provide you much better situational awareness of what’s around and in front of you. While the side-to-side visibility is great, sitting so high up behind a raked windshield cuts out a bit of the view of the sky. Now, this isn’t a problem when it comes to driving, but it does give you a feeling of looking at the world through a narrow letterbox.The front seats themselves aren’t too bad though. The two-tone white- and-black leatherette seats look and feel good, and there’s enough support for your back and under-thighs, as well as sufficient bolstering for your shoulders when tossing the car around corners. The design and similar contouring are seen on the rear seats as well. While two adults, or even three in a pinch, can sit fairly comfortably, the kneeroom is nothing to write home about, and the rising window line robs the back of some airiness. The rear cabin space also gets its own set of AC vents which should be useful on hot days. The Captur is powered by the very familiar 1.5-litre K9K diesel engine. Although this 108bhp motor is identical to the Duster, Renault has fine-tuned it, to boost refinement and drivability. Unlike our experience in the Duster which has pronounced turbo-lag under 2000rpm, the Captur feel more linear and there is a nice build-up of power from as low as 1600rpm. It felt significantly more refined too thanks to the better sound insulation. This motor comes in its own beyond 2000rpm and carries on till 4300rpm, after which power tails off. Even on the highway the punchy mid-range makes overtaking just a flex of the right foot away. Although the sixth gear ratio is really tall, it’s a great cruising tool that keeps the engine spinning at just about 2,000rpm at 100kph; great for stretching your fuel tank. The Captur will be a better city run about than the Duster too thanks to the lighter clutch and slicker gearbox. Like the Duster, the Captur’s ride quality is exceptional. It smothers even the biggest of potholes with ease and even on rough roads you can maintain a fair clip. In fact, the faster you go, the better the ride. Also Renault has worked hard on the refinement and it has paid dividends. The cabin is very well insulated from the outside and it’s only when you cross the three-digit mark that there’s some wind noise entering the cabin through the A-pillars.